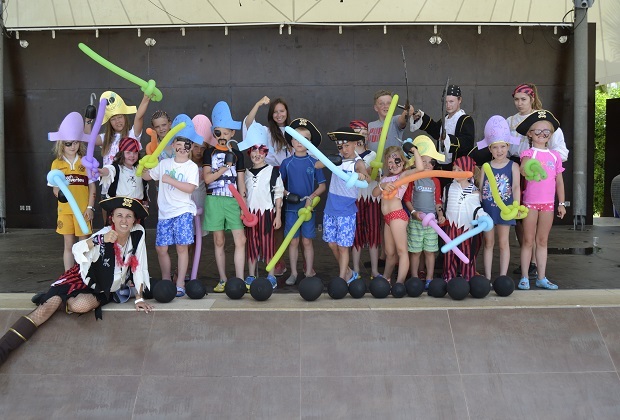 At Club MAC Alcudia we have been providing fun and relaxing family holidays for many years. Since we’ve been welcoming visitors to our fantastic all-inclusive resort, we’ve come up with the ideal way to keep little kids entertained. The idea is to have entertainment for everyone in the family, so that adults, teens and children alike can get the most out of their holiday with us. We’ve found that the smallest tots between four and 10 have the best time in our Mini club area, found at the end of the lake. There’s everything children could want in our area, including a toddler’s pool to splash about in, and plenty of activities run by our dedicated team of entertainers. For 2017, we have some new look features at our Mini club. The old wooden cabin is no more – we’ve replaced it with a funky caravan. Rumour has it this is where our mascots Macky and Misha live when they’re not out and about entertaining our visitors! We’ve also changed the playground area as well. It’s now resplendent with a pirate theme to make it even more fun for the children to enjoy. We love our hot weather, but we know it’s not ideal for children to be out in the sun all day. So, we have the perfect shady area under the trees, which is where we hold most of our activities. There’s even a special Club MAC train to take your children to the Mini club in style. Every week our mascots celebrate their birthday with all of the children in the club – with cake naturally! We also hold a regular Kids Masterchef competition where everyone can have a go at making cake pops. As well as the regular treats, parties and games, there are plenty of exciting things for the children to get stuck into. On Pirates and Princesses Day, the girls can dress up like royalty complete with makeup, hair and nails, while the boys can pretend to be pirates. It’s all finished with a costume parade and fun mini disco. We also have reptile shows where your children can learn all about these special creatures, and the chance to sit down and picnic with Alice in Wonderland and the Mad Hatter themselves. All of this is guaranteed to make it a holiday to remember for the children, and make sure they sleep well at night so the adults can relax too!